This book reads so much like an authentic Don Pendleton book that I checked Fantastic Fiction to see if Pendleton wrote it. He did not; Steven Krauzer did. Krauzer, apparently, had read some of the Pendleton books before starting out. You have a lot of the elements of the Pendleton Bolan in the book, but a decided bit of tomfoolery at the end that is uncharacteristic of Pendleton. In the book, Bolan has to go to Algiers to look for a missing technology executive whose daughter was kidnapped by terrorists of some stripe. For ransom, they want a prototype suitcase nuke the exec’s company had developed. The man goes to Africa himself to find his daughter and is instead captured, and it’s up to Bolan to get him out. Bolan does so early, getting the nominal plot out of the way so it can turn Pendeltonesque. 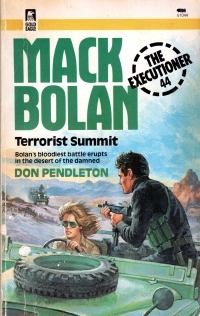 Bolan pursues the woman to a camp in the Sahara where a Soviet-trained bad guy has assembled a summit of numerous terrorist groups to organize them under an umbrella operation headed by him. Bolan infiltrates the base posing as a Mafia-based bigwig and turns the groups upon themselves. This is all pretty Pendletonesque. However, at the climax, Bolan is escaping from the site in a Range Rover when a Jeep pursues. He puts down his rifle to pick up his trademark .44 and has the Range Rover spring into reverse so suddenly he’s coming at the terrorists hard and fast while firing the handgun. Instead of, you know, shooting them with the rifle from a distance. The tacky ending makes me wonder how the whole business worked. Did the editors have this cinematic ending in mind and perhaps on paper when turning it over to the writer to fill in the gaps? I dunno, but it diminishes the book. I’m going to start calling these things the thrown silverware moments in honor of Silent Night: an outlandish moment in the climax thrown in for cinematic value but that leaves any thoughtful reader agape. In my memory, the album cover is more grey than blue. Which gives me a little Christmas feeling in February. Not to be confused with the Christmas feeling I’ll get in March when I finally get to my thank you cards, but still. This book was a little bit of a gift; it was, for me, an unexpected new Robert B. Parker Spenser novel. And although I savaged a lot of his later work on this very blog, because I know (suspect) this will be the last of his Spenser novels (although it was completed by someone else), I enjoyed it. 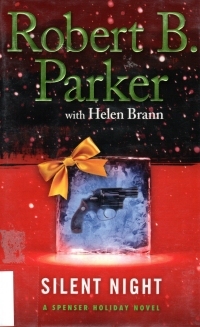 The plot: Around Christmas time, a boy comes to Spenser for help. The boy is associated with an unlicensed youth help facility. Run by the brother of an importer/exporter. Of drugs. The center is funded by the brother, who is unhappy about it but promised his mother to take care of his brother. Someone is attacking the brother who runs the shelter, trying to drive him off. The authorities are on the drug-smuggling brother, and he’s about to bolt, but he’s going to tie up some loose ends–including his former tennis pro girlfriend who might know too much. Until Spenser. You know, trying to sum up the plot, I wonder if it holds up to scrutiny, or if the plot is merely the excuse for some Spensering. Regardless, it’s full of proper Parkeriana: “Wouldn’t it be pretty to think so?” and unnecessary asides and psychoanalysis. We also get the obvious errata, like describing a Playstation and a couple of game cartridges or taking the shells out of a rifle. But because this is the last new Parker Spenser I’ll (probably) read, I kind of viewed them with affection. Although I did laugh out loud in the climax, when the tennis pro is faced with a killer at a dinner party and picks up a knife from the table and throws it at the fellow, stopping him cold with a table knife to the chest. and Helen Brann, I presume. That does not read like something Parker would have done. At any rate, I enjoyed it affectionately, and as time passes, Parker’s rising again in my memory. Perhaps I will fill out my collection of his works after all. Now, with this rosy glow, do I pick up some of the latest John Sandford novels from the library? UPDATE: As he mentions in the comments, Friar has already read this book. And so on. It might not be clear what “that thing” is, which can result in a communications error. For clarity, we’ve established a default antecedent in this case. 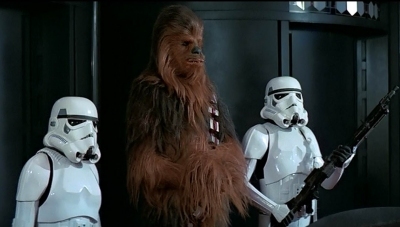 Whenever someone says “that thing” without an appropriate gesture or talking about something specific prior to its usage, “that thing” is replaced with “Chewbacca” in the sentence. This has improved interpersonal and intrapersonal communications greatly. Feel free to use Chewbacca yourself. Three Sizes Ago: Also true, although I’ve not ballooned three sizes, thank you very much. I do have a lot of pants with 34″ waists, which are just uncomfortable, thank you very much, and I might get down there again. I’m pretty sure I have a couple of adult medium things that I’ll never fit in again, but I’m saving them, for in a couple of weeks (or so it will seem), I will have boys that will grow into them (briefly). On the other hand, I have piles and piles of clothing that I’ve gotten and inherited that are not in the current heavy rotation that I’ll continue to hold onto just in case my current crop of clothing fails and I can’t afford to replace it with similar Walmart apparel for ten bucks a throw. And I’ll continue to hold onto the scraps of things that have worn out in case I become crafty or civilization collapses and I need the material to patch the remnants of our clothing to hold us on until one more failed growing season leads us to die of starvation. Or maybe we’ll eat the clothes. One more thing: As to this last, I have been eternally justified in holding onto these scraps of worn out things as just this very weekend, my beautiful wife hand-washed some tunics that bled dye badly, and she needed a couple of old towels to use in drying them. “Do we have any old towels?” she asked. “My darling wife, dawn of the Ozarks, of course we have old towels. We have every old towel we have ever had during our marriage and some from even before we wed,” I said (or words to that effect). And if I hadn’t saved everything like that, where would we have been in our time of need? Buy Then, Pay Later: No, sir, this is not an issue for me; I am not a woman. I do not buy outfits because I might need them later. I buy things to wear now. And to prove my point, I did buy a black button-up shirt a couple months ago (like $10 at Walmart, thank you, George), but I haven’t worn it because most of the slacks and khakis I own (and the ones I wear) are black. So I bought it, and it hadn’t gotten worn yet. So I put it on with a pair of blue jeans just so I could avoid any semblance of this sort of clothes-horse based hoarding. 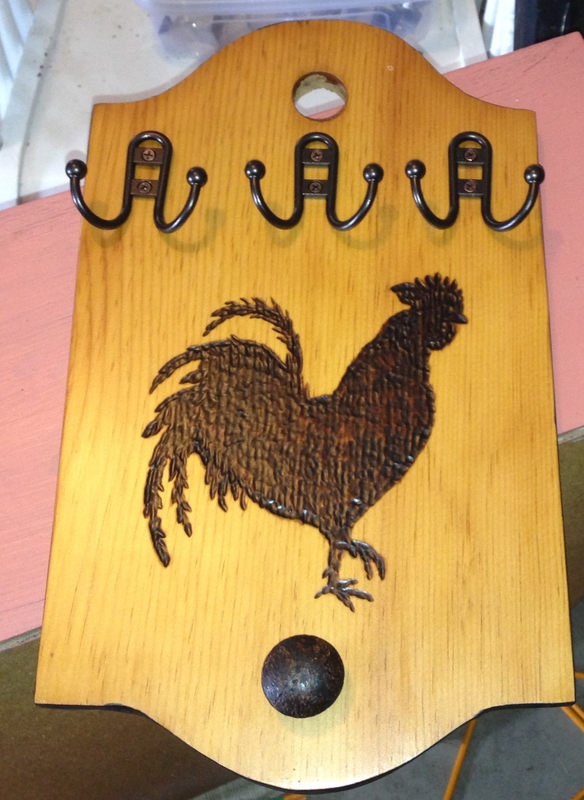 I don’t know anyone who likes chickens, but I had a piece of wood from a garage sale to use the chicken template I had, so I did this and used a couple of hanging hooks to cover a couple holes in it and a woodburned drawer pull at the bottom. So I don’t know who to give it to as a gift, I don’t have enough to fill out a full booth at a craft fair, and I haven’t tried Etsy yet. So I’m hoarding them until I do, I guess. I’ve Got It Here Somewhere: Indeed I do. Fortunately, we have a big enough house with adequate storage that I can generally lay my hands on things as soon as I want them. My twelfth grade elf D&D characters? Got ’em. 1984 Milwaukee Brewers cards distributed by the Milwaukee Police Department? Got ’em. A Commodore 64? You bet. I’m a little less organized with my books’ to-read shelves, though. So I might have a copy of Jane Austen’s Middlemarch. Or I might have two. An 8-Track Mind: Come on, you know me. Although to be honest, I did get rid of our only eight track player last year. But I’ve got spare cassette decks, old computers, videocassette players, DVD players, and so on. Although, in most of these cases, I still use the technologies. So I got a five out of a possible six (and possibly six out of six). I’m very proud of my score. In case you’re wondering, it looks like it takes about nine months for me to forget how much I don’t like a series. I read A Daughter’s Revenge last May, and it took me until February 2015 to pick up this book. Clint Adams, the Gunsmith, is camped out when clumsy horse thieves try to get the drop on him and steal his horse. 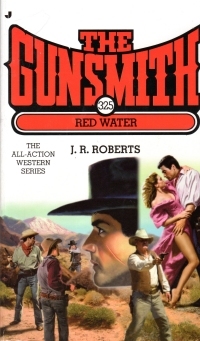 He outfoxes them, goes to a nearby town (Red Water of the title), has an, erm, encounter, discovers the local marshal is forming a posse to hunt those dangerous (but clumsy) outlaws. The Gunsmith thinks that’s odd, and when he joins the posse after an, erm, encounter, he finds the marshal doesn’t have a plan for all the town’s decent gun handlers except that they’re out of town. Apparently, the marshal is in on a scheme to steal the plans of safes made by a local safemaker. Which Adams thwarts amid the, erm, encounters. Of the contemporary Jove Western series, Longarm is the better of the two. As to the Gunsmith series, I think I’ll put them on a higher shelf and avoid them until I forget, again, how I feel about them. As I mentioned, I got this book at the end of December with a Christmas gift card from ABC Books, who were having a half off sale on Folio Society books at the time, which is why I ended up with such a la-di-da edition. But Folio books are pretty handsome editions with heavyweight paper for the pages and a box to keep the dust off the top. I won’t join Folio Society and pay its prices for these books, but when I see them in the wild relatively inexpensive, I might pick them up if they’re something I want to read. And I wanted to read this book after reading Last Seen in Massilia which takes place during the Civil War. This book collects not only Caesar’s commentary on the Gallic War and the Civil War, but also the African War and the Spanish War (which were essentially extensions of the Civil War but with Pompey’s sons. With every campaign, Caesar informs the reader that he has secured a source of corn. This is no mere battlefield heroics tale; Caesar emphasizes the importance of logistics throughout, and the choice of camp sites for their access to food, water, and forage are continuously emphasized. The amount of engineering and digging involved in soldiering in the Roman era took me a little by surprise. Whenever camping, the soldiers fortify their camp, and if they’re going to stay a while, they dig a lot of trenches and build earthen walls. To say nothing about the Battle of Alesia. The Civil War has a different tone than the The Gallic War. The history of his campaigns in Gaul have the flavor of writing for history; the Civil War account has more of the feel of a contemporary political tract, where he’s justifying what’s going on for current readers, not history. Caesar proves awful forgiving at times, allowing those whom he defeats to retain their lives and some of their privileges. This might have been prudent politically and strategically, as it allowed opponents to know that surrender did not mean death. It probably shortened many sieges. This contrasts with the Mongols, who drove refuges from captured towns before them to terrorize their next victims. At any rate, it’s a pretty easy read even though it took me almost two months; as you know, I’ve been reading some other unrelated things alongside it. The translation seems pretty contemporary, and the narrative moves along, although I could have used a couple more maps sprinkled in the text to keep the movements straighter in my head. Also, I admit letting a large number of the names of the participants and places wash over me a bit. I read a lot of these heady tomes, and I’m reading them, for the most part, and not studying them. I’m not highlighting or taking notes to write a paper on them. Perhaps that makes me less of a student than I should be, but the aggregation of the things I read builds connections between them so I am pretty sure I’m getting smarter as I do. But this isn’t the place for a detailed analysis of the Roman impact on Egyptian politics or the Egyptian impact on Roman politics in the first century BC, nor is it really my interest. Sorry, Googlers. Also, note: This book was (mostly) written by Julius Caesar. Before the new Testament. Caesar is, you know, Caesar. A figure of such import to history that rulers bore his title two millennia later (that’s the Russian Tzars, as a reminder). There’s something inherently cool in my mind about reading his books. I’ll probably feel the same way about reading Thucydides and Plutarch once I really get into this Greek-Roman History rabbit hole. I recommend it. It looks like you can get this edition for about $40 on the Internet, but the Kindle versions are cheaper. So I’m sitting in the parlor, reading nine month old Wall Street Journals (Russia is causing trouble in Ukraine! Syria is a mess! The whole middle east is going up in flames! ), and my six-year-old comes into the room. 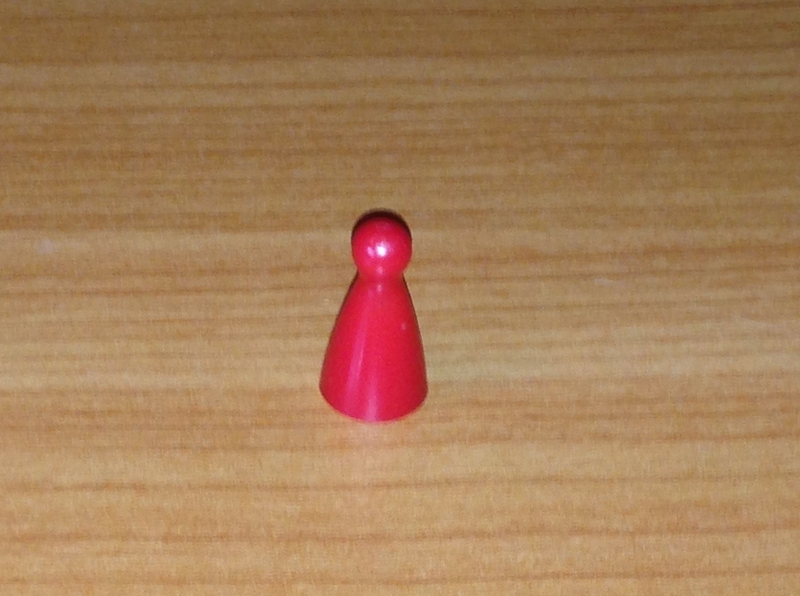 He has the cover for the pegs from the Electronic Battleship game, which means the pegs are all over the floor somewhere, and a small plastic toy bin inverted, which means the toys are all over the floor somewhere. He’s banging on the bottom of the bin in a beat that I’ve heard described as quarter notes. “Guess the song,” he says. “Jesus Loves Me,” I say, looking over my paper much like I expect Clarence Day’s father would. I’d heard him mention that song to his older brother a couple minutes ago. He wandered out of the parlor and reappeared a moment later, beating on the bin with the same rhythm. “Guess the song,” he says. “‘Rock You Like A Hurricane’,” I answer. He looks surprised. “You’re right!” he says. “You win!” he says. Then he gives me my winnings, a piece from some random game that means the rest of the game is all over the floor somewhere. “It’s an honor just to be nominated,” I reply. And he went off, drumming, towards the bedrooms. The tagline for the gun is fits in a pocket. The woman is wearing a sundress with no pockets. Ergo, if she’s not going to put it into a pocket, she could opt for something larger or with a larger magazine. Or, men, you could not leave her pocketless. 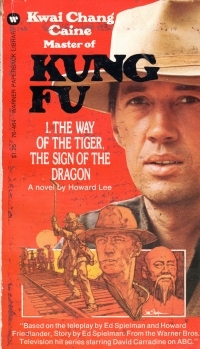 This book is one of several books tied into the original Kung Fu television series from the 1970s, in which a half-American Shaolin priest with a bounty on his head wanders the west having adventures. It ran for a couple of years and then ran in syndication for far longer (ask your dad what “syndication” is). Then, in the early 1990s, a spin-off appeared featuring the grandson and great-grandson of the original character, and that series played for longer than the original. I think I saw more segments and/or episodes of the spin-off than the original. So I didn’t come to the book with an existing love for the characters or story. The book starts much like a pilot of the television series; in a series of flashbacks, Caine’s training is revealed and the events leading to his exile from China and the bounty on his head. In the present day of the book, which is the old West, Caine is fitting in with a bunch of railroad building Chinese immigrants driven by a harsh and murderous foreman who insists upon following the exact route planned for the railroad even though the company’s pesky geologist predicts disaster in blasting through mountains. When the disaster occurs, the Chinese rise up and only Caine can protect them from slaughter at the hands of the railroad guards. It’s a short paperback, but it’s not as quick a read as could be expected. There is little dialogue, and there are stretches of paragraphs or pages of unnecessary musing–I guess this is the character development. The flashbacks aren’t problematic, though, and if you’re not familiar with the television series, they do provide a bit of parallel tension as his training unfolds. I’ve got a bunch more of these paperbacks, and I’ll read them by and by. It did interest me in looking up the television series, but it doesn’t look like it’s free on Amazon Prime, so I won’t rush out to buy the DVDs for them. But the book is working its marketing and synergy magic, albeit forty years later. Disney films end up with fewer corpses on the stage than their source material. 20 Disney Movies That Are Based on Bizarre and R-rated Stories/How Your Favorite Disney Stories *Actually* Ended. 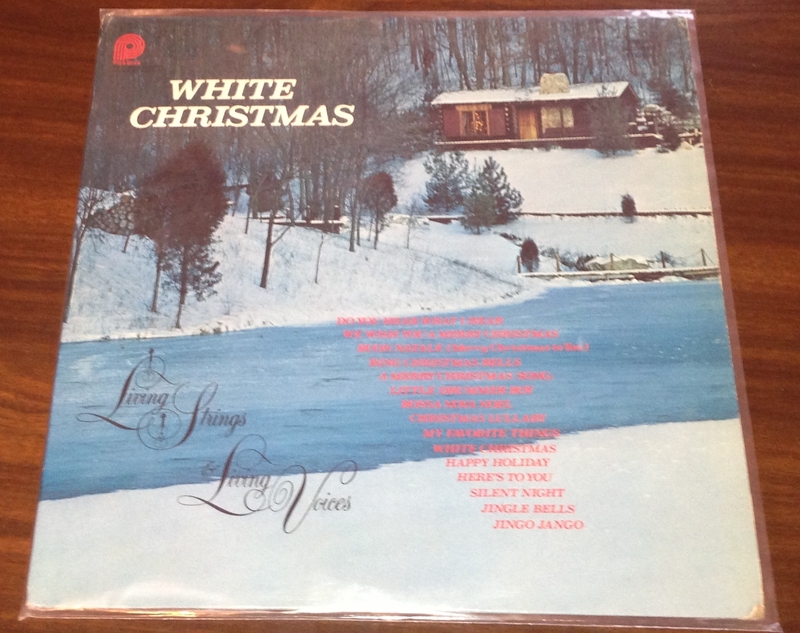 I bought this LP for a buck, probably, at Recordhead Music in Milwaukee, Wisconsin, in the early 1990s. I’d just gotten a sweet deal on a stereo with a turntable (Originally priced $20, but Gome’s mom insisted he charge me more because it had big speakers, so I paid $25 for it. After that, I bought a lot of inexpensive LPs from the era. A couple of years later, I sold it at a garage sale for about $20, but it had my copy of The Dark Side of the Moon on it, and I let Pixie, the friend who bought the stereo, keep the LP since I meant to get the album on CD. I did, more than a decade later). Sorry, I was talking about the Fletch soundtrack here, wasn’t I? When I bought the LP, it seemed old. Probably because it was used and it was an LP in the world where audiocassettes had taken over. But it was only five or seven years old at the time, and I’ve owned it for twenty-five years (off and on). 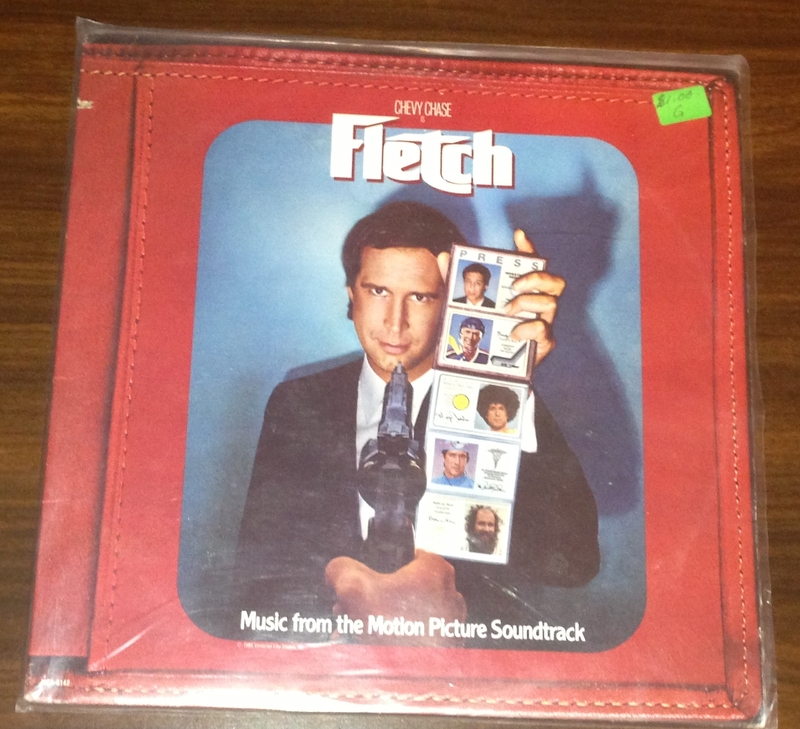 I bought the LP because I liked Fletch from the books, and I think I’d caught the film once or twice on cable. It didn’t get heavy rotation on my $25 stereo turntable–Billy Joel and Pink Floyd did at the time, and most of my music library was cassettes anyway. When I graduated college and moved home with my mother, she had a large console stereo with a turntable, and since I had an English degree, I guess I expected to live there for a while, so my turntable became superfluous, and I sold it. When I moved out a couple years later, I left my albums in my mother’s custody since I didn’t have a turntable. After a while, she migrated my LPs to the garage sale bin. Apparently, nobody wanted it for a dollar, which is good, since it was not my mothers to sell. On the plus side, she did not set it on a table in her driveway the (rainy) night before the sale (unlike several boxes of my books), so it remained intact until my mother passed away and I took possession of my remaining records, her LPs and 45s, and her mother’s LPs and 78s. After we moved to Nogglestead, we put a radio with a turntable on it in our parlor. Eventually, I brought up the LPs from the basement. 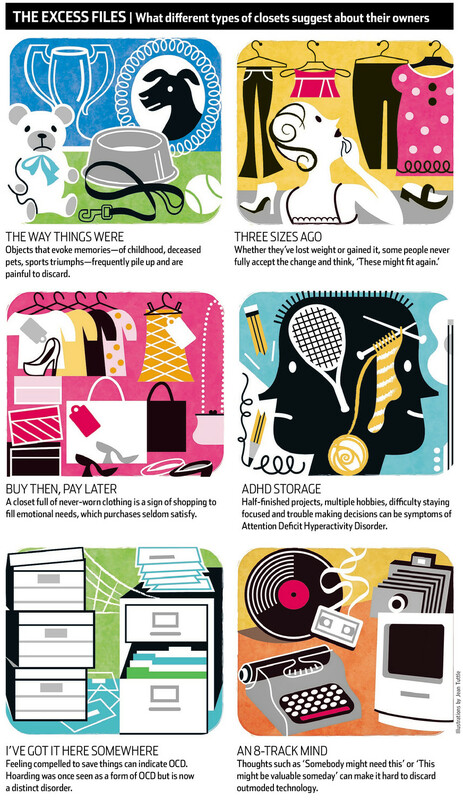 We didn’t have many then–this was before I listened to LPs daily and started buying them in vast quantities at book sales, antique malls, and thrift stores. In the mornings, while preparing breakfast for our children, I’d play this album first thing in the morning. My youngest child, three years old at the time, would come and dance to the album. Dance, to a three year old, means run around in circles while the music plays. Come to think of it, this is what dance means to me, although with more air guitar, head nodding, and rhythmic finger pointing (which explains why I am not allowed to dance). On many occasions, I’d play the LP before the child was out of bed, and he would tear out of bed, run down the hall, and begin his circling dance to Stephanie Mills before he was fully awake. For some reason, the older brother, five at the time, started calling “The Name of the Game” the Charlie Brown song. I’m not sure why; perhaps the intro reminded him of Charlie Brown’s teacher. But his brother latched onto that and called it the Charlie Brown song for months after his brother stopped in the way the younger brother does. Where the utterance of the admired older brother becomes a badge of their alliance, where repeating it proves the younger’s loyalty to the older. Or something. Because the laddie still does it at six years old. The other night, the younger brother repeated one of his brother’s passe quips (“Ketchup saves the day!” as the reasoning behind getting the said bottle from the refrigerator with flourish before dousing a lovingly crafted entree to make it palatable to children). Inspired, I put the album on and recounted its history, including the Charlie Brown song. And the younger son danced with his mother in the parlor with more sophisticated dance moves gleaned in the first grade, apparently. So this album, just a silly soundtrack from a decent movie from a good set of novels provided a set of memories years past its social relevance and continues to provide new memories. Not bad for a buck. Plus, it’s got a couple of fun songs from Dan Hartman and Harold Faltermeyer. I’ve been reading this book to my son(s) over the course of the last two or three years. It’s a 368 page book, so cut me a little slack. 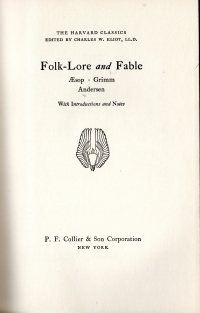 Also note that we did the book in fits and starts, where we read a bunch of Aesop together, both boys and I, at the outset, but once we got into the relatively bloody Grimm brothers, we held off a bit. Eventually, the older boy wanted to hear the stories more than his younger brother did. Aesop’s fables are good for children. They have a message in them, and their fanciful use of animals will make the children pay attention. The Brothers Grimm are pretty bloody. There’s a lot of chopping getting done and bodily harm, but most of the stories have a redemptive element if not a Christian message. Famous Grimm stories include “Rapunzel”, “Hansel and Gretel”, “Cinderella”, “Little Red-Cap”, “Little Snow White”, “Rumplestiltskin”, and “The Golden Goose”. When Disney got a hold of them, the films had more survivors than the stories. Which is the same complaint I had about Disney’s Hamlet. Also, the brothers reuse elements of their stories, so if you read the whole kit and kaboodle at once, you’ll feel a sense of deja vu. Hans Christian Andersen has a reputation about being child friendly, but his stories are about as bloody as the brothers Grimms’, and they often don’t end on a note of redemption. Instead, some like “The Emperor’s New Clothes” just kind of end abruptly, while others end like “The Shadow” end with a nominal protagonist losing in the end. Hans Christian Andersen is not unlike a children’s Stieg Larsson. Famous HCA stories include the aforementioned “The Emperor’s New Clothes”, “The Little Mermaid” (which does not probably end like the Disney film), “The Ugly Duckling”, and the source for at least one Kate Bush song (which does not end the same way as the song or its video). All in all, a good collection. Now we’re going to read the Harvard Classics Arabian Nights, and three years’ hence when we finish that, the lad(s) should be ready for Plato and Aristotle. Quick, when does this expire? Back in my grocery store days, we would assume this was April 15, 2016. 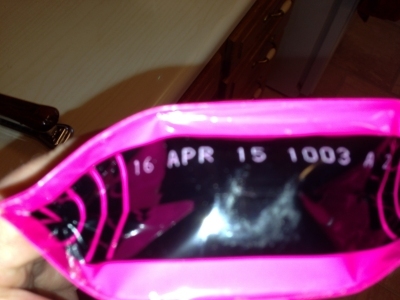 And expiration dates that did not have a year in them (and there were such things at that time) meant next year. Because I have suffered ignomious defeats at three recent trivia nights, I’ve started recording Jeopardy! and playing along to assure myself that I still know something about trivia (and it appears I do, as I get a number of the questions right). But the thing I’m re-learning is that Jeopardy! is the center of all human knowledge. I knew this in the olden days. By “olden days,” I mean the period when I watched the show daily. This would have been about the time where the first child was born, where game shows presented a good short bit of television to watch while feeding a baby. This even precedes my brief stint as part of the Jeopardy! contestant pool a couple years back. Now, what do I mean about Jeopardy! being the center or nexus of all human knowledge? 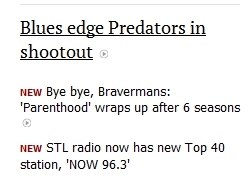 I mean that when one plays along with the program, one often finds the trivia in the clues elsewhere. A clue included a photograph of Nick Offerman as character Ron Swanson, and I got it almost right (I said “Rich Swanson”). My wife asked me how I know, and I mentioned my comparison of Ron Swanson to Archie Bunker. Then, as we fast-forwarded through the commericals, Archie Bunker’s face appeared in a commercial for some collection or another. It continues to appear in commercials during the program, but I’ve not stopped to see what collection of DVDs or cable channel it’s promoting. A clue about books about baseball featured George Will’s A Nice Little Place on the North Side (the answer was the baseball team, the Chicago Cubs). Yesterday, I get to this book review in the Wall Street Journal (because I am in fact eleven months late in reading the physical newspaper). There’s a category called Europe in Latin, and I’m familiar with all the names because I’ve reading Julius Caesar (although I don’t do as well as one would hope). These are only a few examples, but this happens all the time. I see the things from the clues on Jeopardy! elsewhere, or I get the answers because something on Jeopardy! I have recently seen in real life. I know there’s a behavioral science explanation for it, that I’m keyed in on these bits of trivia because they’re isolated on a program I enjoy watching, but come on, this is the Internet. I have to somehow make this a conspiracy or a panic like the D-Day Crossword Panic of 1944 (which undoubtedly will be in Jeopardy! this week). This book shares an awful lot of plot with The New War. Grimaldi flies Mack Bolan into the jungle, where Bolan is supposed to rescue a man from an enemy camp, and then Grimaldi returns to save the day. 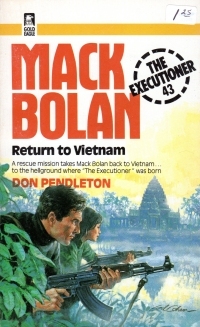 This time, though, Bolan is returning to Vietnam to exfiltrate a soldier who stayed behind and who knows about American POWs still held by the Vietnamese. He joins up with some Hmong in-country and runs into difficulty when a beautiful resistance fighter fancies Bolan over another man in her unit, and that man is a hothead who might cross Bolan to get the girl. Unfortunately, this book was a bit of a slog for a variety of reasons. For starters, there are some technical inaccuracies to consider: For starters, the method of getting Bolan into the jungle is for him to eject from a Harrier (the new hotness at the time), and then for the Harrier to fly back to base. With part of the canopy missing. Presumably, Bolan will land and go on fighting, albeit an inch or two shorter for the time being (ejecting from a fighter is not the same as jumping from a skydiving school, kids; it’s a violent action that sometimes knocks the ejected unconscious). Then there’s a lot of bringing weapons up to the hip in firing position. Oh, and the firsts. When thinking about how good Grimaldi is, Bolan thinks, “I’m a pretty good pilot myself.” Uh. That’s new. And he lights a cigarette. And he sheds a tear. So Bolan in this book is a bit more of a stock action hero than the man shaped by the history of the first forty books in the series. He even moons over the Hmong woman even though he’s got the love of his life in America. On the other hand, the contact with Stony Man Farm is dismissed, and we don’t get chapters of Hal and April fretting or remembering what an awesome guy Bolan is, either. Still, I think I’ll take a break from the series for a bit. Oh, and if you’re wondering whether I’m actually reading Julius Caesar or merely using its presence on my chairside table as a pretext to read junk: I’ve finished The Civil War, but it’s all Super Mario Brothers on poor Caesar. “Thank you, Caesar, but victory is in another castle!” And so Caesar is off to Egypt. I’ve got the Alexandrian War and the Spanish War to go. This book says its text is by Abraham Lincoln and the photos are by Mathew Brady; however, only the latter is true for the most part. Although the book does quote Lincoln on every page, the editor’s text far outweighs Lincoln’s words. The book is 200 pages of photographs, and the images themselves take precedence. The editor provides a light running history of the war accompanying the images, and then Lincoln gets his say at the end of each snippet of historical text. Lincoln’s comments come from speeches, letters, and cables he sends during the course of the war. 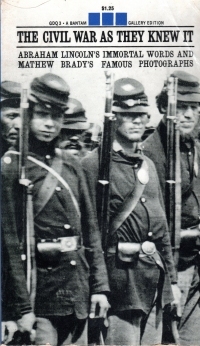 It’s a quick perusal–although it’s 200 pages, I ran through it in a little over an hour–but the book has a good summary-level review of the Civil War and, most strikiningly, the photographic record of a war one hundred and fifty years ago. That’s before the Internet, child. And before television, even over-the-air broadcast television. A reader of the Ace of Spades HQ blog, which makes him a moron because that’s what the community over there describe themselves as, has reviewed John Donnelly’s Gold and gave it four out of five stars. So he’s not a real moron; he’s a man of discriminating taste. Back in the olden days, when I was young, we had a Dungeons and Dragons campaign where I, the noble Dungeon Master, allowed the players to adopt wolf (or dire wolf–forgive me, this was twenty-seven years ago, so I am a little hazy on this point) cubs and raise them. So my brother and the two Jimmies eventually suited them up in armor and then mounted a sword on their backs so the wolves could charge opponents in attacks. 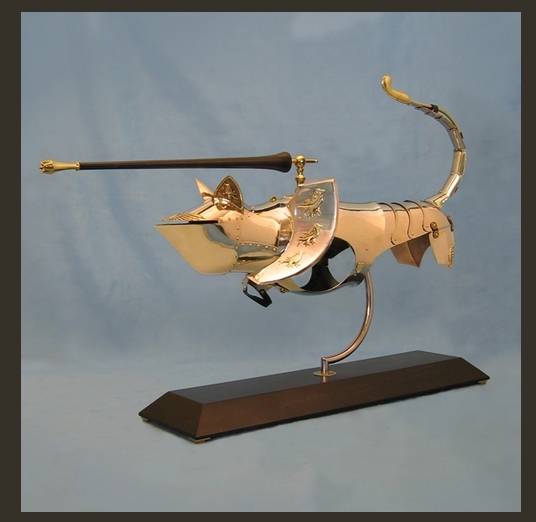 Except that’s armor for cats. We might need some since we had a new tabby scouting our back door last night for a possible invasion.